Being diagnosed with high blood pressure can be scary, especially if your doctor is recommending medication to keep your hypertension under control. Medication can be quite expensive. Not to mention possible side effects such as dizziness, nausea or vomiting, and erection problems. However, it is not your only option in the fight against high blood pressure. Natural methods like paying attention to what you eat, getting adequate exercise, limiting stress and getting good-quality sleep can all play a role in lowering blood pressure. In fact, paying attention to the lifestyle factors that can lower blood pressure can offer multi-faceted health benefits that can enhance your quality of life. Check your blood pressure at different times during the day. Just because your blood pressure is high in the afternoon doesn’t mean it’s going to be at the same level throughout the day. You may have had a stressful commute into work in the morning or a bad morning at work. Try taking your blood pressure when you wake up in the morning, before you’ve had any coffee, or when you get home and you’ve had a chance to relax. Just be sure to check it before you’ve had dinner or a drink. If it’s at the same level, talk to your doctor about the best ways to lower blood pressure. If you do have high blood pressure, there are ways that you can have lower blood pressure without having your doctor reach for their prescription pad. By removing or limiting processed and refined foods from your diet, you could significantly reduce your blood pressure. These types of food are loaded with sodium and are the reason so many Americans exceed healthy sodium limits, which range between 1,500 and 2,300 milligrams (mg) a day. For example, you may not taste the salt in a slice of white bread or pizza dough but it’s there. Stick to homemade foods and iodized table salt for seasoning. Eating calcium-rich foods is consistent with an anti-hypertension diet because the mineral helps regulate the relaxation and constriction of blood vessels. Calcium is largely found in vegetables like leafy greens and beans. Dairy is also a great source of calcium, so if you’re not lactose-intolerant, eating some cheese, yogurt, or milk can provide great servings of calcium. It should be noted, however, that these benefits are not seen with supplementation. There is data showing that calcium supplementation can lead to arterial plaque build-up in the heart, and should therefore be avoided if high blood pressure and heart disease are concerns for you. Nutrient-dense foods are the hallmark of a heart-healthy diet. Vegetables, dairy, whole grains, nuts, chicken, and meat are all rich in magnesium that can benefit the heart and blood pressure levels. Magnesium helps to relax blood vessels so that blood moves through more easily. One way to boost magnesium intake is to include more unprocessed foods in your daily diet. Potassium is essential to heart health, particularly how much you consume relative to the amount of sodium you take in. Sodium and potassium are key electrolytes that must remain in balance for optimal functionality and blood pressure stability. To optimize potassium intake and the potassium/sodium ratio, and ultimately reduce your risk for high blood pressure and heart attack, you want to eat more potassium-rich foods like fruits, vegetables, and legumes in their natural form while avoiding heavily salted processed foods. There are associations showing that people who eat a high-protein diet are less likely to have high blood pressure. This may be because those who consume high-protein diets tend to be interested in fitness and muscle building. Therefore, the relationship may have more to do with lifestyle. That said, someone who is eating more protein often has less room for refined carbohydrates and processed foods, which are the types of food that ultimately lead to high blood pressure and heart trouble. Cutting added sugars and refined carbs are extremely important to good heart health, which is essentially having the adequate nutrition to function optimally and provide the easy passage of blood through arteries. These foods are not only largely void of nutrition and calorically dense, but they’re also typically high in substances like fructose, which studies have shown may increase blood pressure and blood pressure variability. These foods can also contribute to weight gain and lead small, dense particles of LDL cholesterol to form along arterial walls, causing higher blood pressure. Foods rich in flavonoid antioxidants can help relax the blood vessels to encourage better blood flow. Dark chocolate, red wine, and dark berries are all great sources of these valuable antioxidants. What’s important to note, however, is that moderation (in regards to chocolate and wine) is essential for the benefits. Drinking any more than one or two glasses of wine, or eating more than one square of pure dark chocolate at a time can sabotage your efforts. Caffeine intake can lead to acute increases in blood pressure, which may pose a danger to people with hypertension. Although caffeine response is individualized and dose-dependent, if you feel your heart racing or become light-headed or sweaty after two cups of coffee or tea, reduce your dosage or switch to decaffeinated blends. A great way to get the pick-me-up of caffeine without caffeine itself is getting outside for a little fresh air and exercise. A five-minute walk may be all you need to perk up! Home cooking is really the best way to ensure you’re eating blood pressure-lowering foods. And we’re not talking about microwave or frozen items, but food made at home from raw ingredients. The food served in a majority of restaurants is loaded with sodium, added sugars, and potentially unhealthy fats, and is often much higher in calories than anything you would make at home. If you can get in the habit of cooking meals large enough for leftovers, focusing on eating a high-protein and healthy fat breakfast each morning, and limiting your intake of prepared meals, you could significantly improve blood pressure. 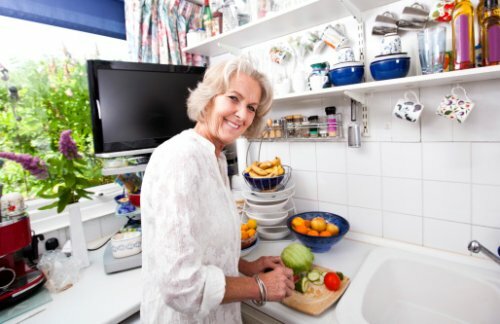 Try and include a variety of fruits and vegetables in your meals to really get the most benefits from eating at home. There are some herbal supplements that may help lower blood pressure, including turmeric, garlic, basil, cinnamon, and cardamom. But really, the best way to consume these is to add them to your home recipes. Using supplements may not save you that much money relative to blood pressure medication, and it can be hard to rate their efficacy and safety. Experiment with herbs and spices in the kitchen while trying to limit pill intake. Water can help keep your blood pressure down by fighting against dehydration. Dehydration can lead to increased blood pressure by closing off capillary beds and causing your body to retain sodium. Try keeping a steady intake of water throughout the day and monitor hydration levels by paying attention to the frequency and color of your urine. You are adequately hydrated when your urine is a clear or light-yellow color. Regular exercise and activity is one of the best ways for long-term reductions in blood pressure because it promotes a stronger heart and improved blood flow. You may notice your blood pressure or heart rate increasing during exercise, but it should decrease about two hours following exercise and remain steady for a number of hours. It’s recommended that you take a progressive approach to exercise, starting with light-to-moderate work until your body is capable of handing more. Going too hard out of the gate can be dangerous. Losing as little as five pounds can have big-time benefits for blood pressure. The more weight you’re carrying, the harder it is on your heart to move you around. Using a combination of healthy eating and exercise is the best way to reduce weight, blood pressure, and contribute to a healthy heart. Deep, slow breathing can be a quick way to reduce blood pressure, especially during periods of high stress and anxiety. This skill is definitely worth learning, as higher levels of stress hormones often lead to spikes in blood pressure. So, you can activate deep breathing when you feel your heart racing. Getting at least 30 minutes of exercise on most days of the week can lower blood pressure by 4 to 9 millimeters of mercury (mmHg), the measurement for blood pressure. It’s important to exercise consistently for these benefits because once you stop, blood pressure can creep back up—it’s all about using your body. Sometimes, getting outside for some fresh air—and maybe doing a little a walking when you’re out there—can help lower blood pressure. Along with the helping to circulate oxygen, getting outside can allow you to absorb vitamin D, a nutrient that is closely linked to blood pressure and heart health. About 20 to 40 minutes of sun exposure per day, depending on your complexion, can help you get adequate vitamin D.
Adding a few weight-lifting sessions to your weekly exercise routine is another way to help naturally lower blood pressure. It should be noted that weight training will lead to acute increases in blood pressure, so having your workouts approved by a doctor and monitored by a certified trainer is recommended. However, in the long term, it will lead to lower blood pressure, improved body composition, and reduced demand on the heart. Studies show that alcohol consumption can greatly influence your blood pressure—for better or worse. When drinking, try to limit your intake to no more than two drinks per day if you’re male and no more than one daily for females, while going without when you can. Although light-to-moderate drinking may lower your blood pressure and general risk of heart disease, there is no reason to start drinking if you currently do not. Drinking too much alcohol can raise your blood pressure to unhealthy levels. Smoking offers a host of health problems, the biggest being an increased cancer risk. But it can also lead to acute increases in blood pressure immediately following a cigarette, likely due to oxygen constriction. Furthermore, lung cancer can create problems to your entire cardiovascular system and massively increase the risk of heart attack. Sleep is strongly associated with blood pressure, and if you’re not getting enough deep, restful sleep you could be at increased risk for hypertension. This could be, in part, because a lack of sleep leads to increased stress, cravings for junk food, weight gain, and lower activity levels. Experiencing chronic stress can boost blood pressure and diminish heart health by keeping your heart pumping at a rapid pace. This can be heightened by stress’s ability to stimulate fat storage, trouble sleeping, uncontrolled eating, smoking, and drinking. Finding ways to cope with stress can help keep your blood pressure low and can include: changing expectations; practicing gratitude, mindfulness or meditation; exercise; planning; and making time to focus on things you enjoy. If you have a baseline knowledge of your blood pressure, you can track where it is on a daily basis. You can also learn how your body responds to different interventions and always have a general idea of your heart health. Noticing inconsistencies or spikes can also help you take appropriate action when needed. Listening to relaxing music that you enjoy an also help briefly lower blood pressure in response to stress. Sitting down to some classical music, or some light songs that make you feel good, may help you relax and restore a normal blood pressure. If you feel that diet and exercise aren’t doing enough to help you lower blood pressure—though really, they should be—then acupuncture might be worth considering. Although the data on its efficacy is limited, studies have shown that repeated treatments can have moderate effects on blood pressure. Sleep apnea, which has the potential to lead to heart attack and high blood pressure, is marked by unconscious gasping for air during sleep. It not only poses immediate threats to blood pressure, but it can drastically reduce the amount of sleep sufferers get every night. If you’ve had a partner complain about loud snoring, having a sleep assessment could be a big help in your fight against the dangers of high blood pressure. Work can be a major stressor; there’s no doubt about that. And it’s a lot easier to “work less” in theory than to actually accomplish it. But you can, perhaps, try to include some more time in your day—say five minutes an hour—to step away from what you’re doing, clear your head. and refocus. You can also attempt to leave work at the office, avoid it on weekends and evenings, and do your best to focus on less stressful areas of your life. Whether you want to find ways to slow down acute bumps in your heart rate or lower your blood pressure in the long-term, natural means are probably your ideal method. The most effective tips to lower your blood pressure encourage a healthy heart and lifestyle, which can also help protect you from a multitude of other chronic illnesses. Don’t be held down by medications and your current health status. Use natural means such as diet and exercise to help improve heart health and quality of life.